What determines the efficiency of a chainsaw in cutting wood? I believe the most important determinant is the quality of the cutting chain; you need the best chainsaw chain. To maintain the efficiency of this power tool, many owners believe sharpening the chain frequently is the solution. However, the process of sharpening the chain can be tiring. Besides, it rarely improves the efficiency of the chainsaw. The wisest decision is to use a brand new chain. But finding the best saw chain is not an easy thing, especially if you have no or little experience with this chainsaw accessory. You have to use the right chain. Sawing away with the wrong chain increases the risk of dangerous kickbacks. There is also the risk of the chain binding. Furthermore, a wrong chain would make the job of sawing a tough and time-consuming. So, how do you go about buying the best chain for your chainsaw? Do you simply walk into a hardware store and pay for the first chain that catches your attention? I guess not. That is why I have evaluated the top brands of chainsaw chains based on their design, performance, construction, customer reviews and price. 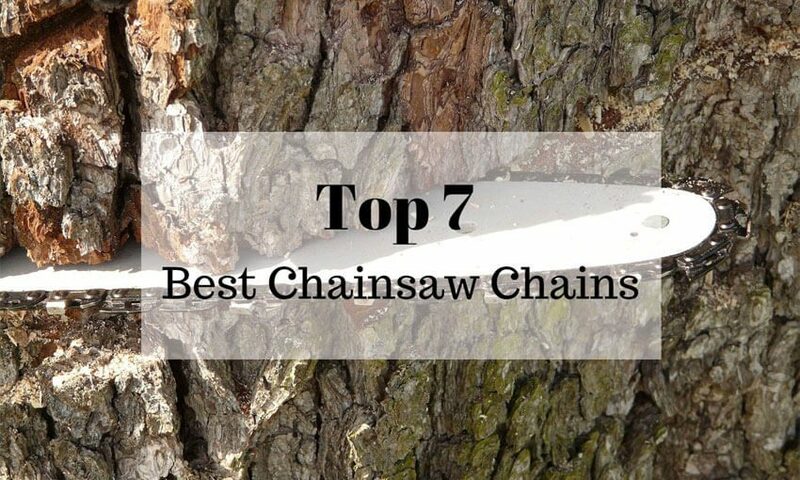 Before reviewing the top 7 chainsaw chains currently in the market, let’s first discuss the types of chain available. Only three types of chains for chainsaws are available in the market. Having knowledge about these types will greatly help you in decision making so that you can buy the best accessory for your tool. You will identify chisel chains by inspecting their teeth. Such chains feature square cornered teeth. This gives them the ability to cut into material very fast. They also have the largest number of teeth of all the three types. These attributes result in the smoothest cutting outcomes. On inspection, these chains feature round cornered teeth. They come with the fewest number of teeth of the three types. Although about 10 percent slower than the chisel chains, the semi-chisel chains are capable of retaining sharpness for a bit longer. This type of chainsaw chain has the fewest number of teeth of the three types. They feature extended bars from one tooth to another. This design makes them great choices in tasks that require the chain to hold wood chips with much greater aloofness before letting go. An example of tasks that require extend bars is tree felling. Skip chisel chains will remain sharp for extended periods. They are also capable of handling larger tasks before wearing down. Because of the design of the teeth, this type of chains has the largest risk of kickbacks. I have selected 7 of the best chainsaw brands that will not only provide you with great performance but also value for your investment. If none of the 7 models fits your needs, you can use my in-depth and accurate buying guide to make an informed choice. 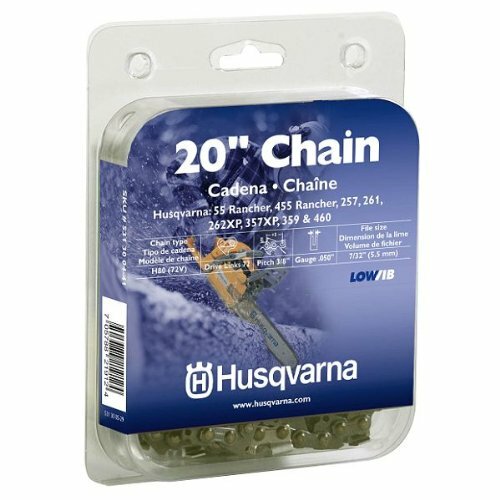 This chainsaw chain from Husqvarna. It has well-designed drive links that will fit perfectly into the guide of your chainsaw. These features, in combination with great efficiency, make the Husqvarna 531300439 one of the best chainsaw chain for cutting firewood as well as other tasks. Another great feature of this saw chain is its compatibility. It is compatible with all 18-inch chainsaws from Husqvarna. You also use it with other 18-inch chainsaws from other brands. The distance between its drive links (pitch) measures .325-Inch with 0.50-inch gauge. The chain is high performance and low vibration. It does adjudge an edge comfortably with minimal stretching. Sharpening the chain when it gets dull is very easy. It is even better if your chainsaw is self-sharpening. Husqvarna 531300439 is easy to install, durable and fits perfectly. 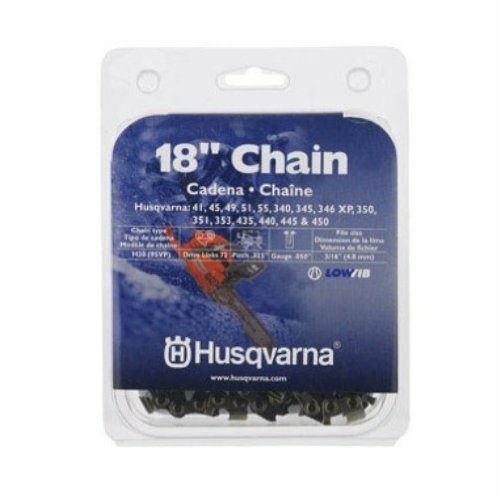 This chain is a great choice for professional tasks in demanding conditions common with commercial use. 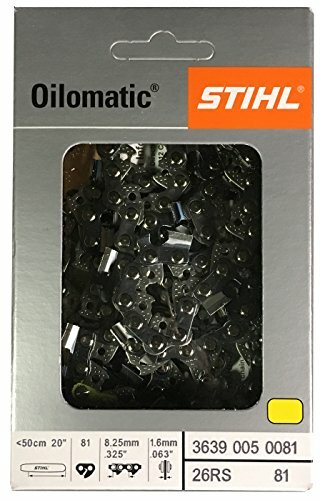 If you own 55 Rancher, 455 Rancher, 460 Rancher 257, 261, 262 XP, 359 and, 460 Husqvarna chainsaws, this is the perfect saw chain for you. The Husqvarna 531300441 20-inch is one of the most versatile, high-performance chains for chainsaws. It’s capable of making quick cuts through different materials. Its 3/8-inch pitch, 050 gauge cutting chain saws easily through the toughest woods. It features Husqvarna’s technology that ensures low vibration and minimal risks of kickbacks. The result is reduced user fatigue as well as optimal safety during use. This unit is engineered for 20-inch guide bar chainsaws. When combined with the fast cutting ability and sawing power, the chain can efficiently handle large diameter woods with ease. The Husqvarna 531300441 is extremely durable and lightweight. It can slice through hardwood with speed and ease yet maintain sharpness for extended periods. The chain is also easy to install and retains sharpness for extended periods. It is also one of the most affordable chainsaw chains in the market. 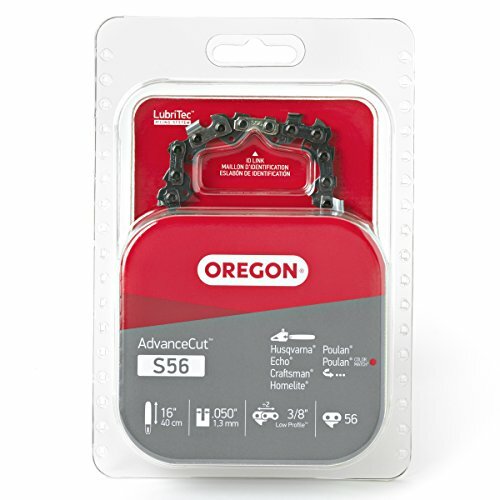 The Oregon S56 AdvanceCut saw chain is one of the best choice semi-chisel chains for your 16-inch chainsaw. It is compatible with Echo, Craftsman, Homelite, Remington and Poulan brands. 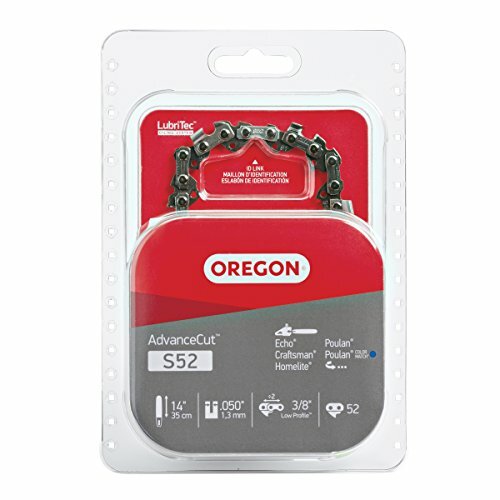 Oregon engineered this chain for precision cutting. Its cutter chain is heat-treated and hard-chromed for long lasting sharpness and durability. The chrome-plated cutters provide hard surface and better resistance to wear. You will thus spend more time cutting and less time grinding or filing the chain. The brilliant design of the chain ensures it cuts smooth and fast with minimum vibration and kickbacks. It was thus created for DIY enthusiasts because of its dependable performance and incredible durability. The Oregon induction technology hardens and quenches all the rivets of the saw chain. This delivers great quality load bearing surface that improves strength and resists wear. The resultant minimal chain stretch and wear means fewer adjustments needed for the chain tension. Another great feature of the S56 AdvanceCut is the LubriTech Oiling System. This system automatically lubricates the chain and the guide bar resulting in less downtime. Similar to its cousin reviewed above, the S52 AdvanceCut saw chain is compatible with 24-inch guide bar chainsaws from Craftsman, Echo, Homelite, and Poulan. However, you may need to confirm compatibility before you make a purchase because not all brands mentioned are compatible. Like the latest Oregon chains, this model feature semi-chisel type of cutting chain that is chrome plated and heat-treated. This improves durability and wear resistance. The unique cutting design of the chain delivers smooth cuts with minimum kickbacks and vibration. The low vibration design reduces the vibration by 25 percent. The chain features 3/8-inch pitch, .050-inch gauge with 52 drive links. These engineering features are meant to improve safety, quality, and performance of the product. An advanced LubriTech Oiling system ensures that the chain and the guide bar is lubricated automatically. This improves the durability of these parts and minimizes the tool’s downtime. You can buy this incredibly affordable 14-inch chainsaw if you are a DIY homeowner in need of a dependable tool to maintain the trees in your property. Made to fit 8-inch Remington and Poulan brands of pole saws, the R34 MicroLite saw chain is among the best you can find in the market. It is brilliantly engineered to deliver the same dependable performance of the Oregon brand. As is evidenced with the preceding Oregon chainsaw chain review, this unit is homeowners’ and professionals’ delight. Advanced engineering technology ensures tough, dependable and high-performance cutters. 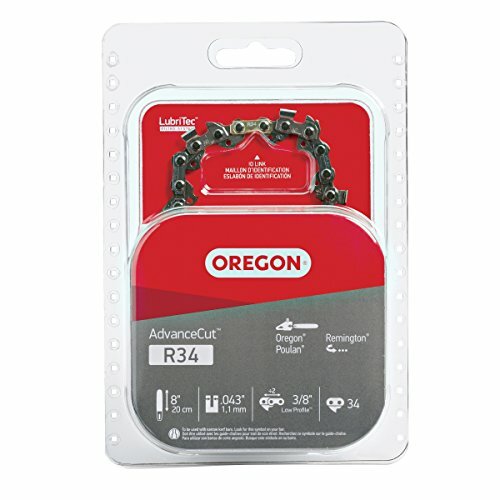 Oregon made these chains specifically for pole chains known for their versatility and lightweight. The saw has a narrow kerf .043 gauge and 3/8-inch pitch. This boosts efficiency and needs less power compared to standard chains. Such design makes the chain to remove less wood fiber during operation. Classified by UL as low-kickback saw chain, the Micro Lite is one of the safest chains to use with your pole saw. It also operates with low vibration making the chain very easy to use. You have to carry out some research to ensure you buy the correct chain for your pole saw. 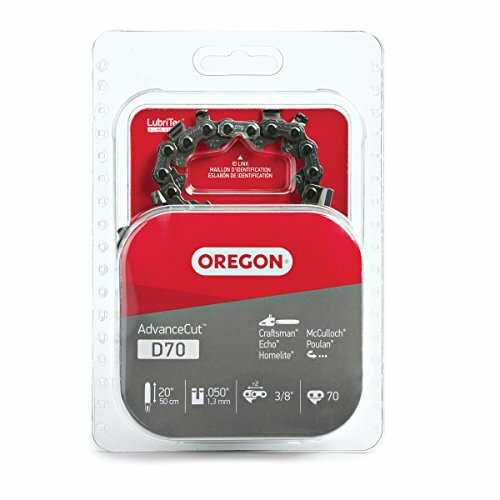 Designed for saw sizes 50 to 100 cc, the Oregon D70 20-inch saw chain is a great choice for DIY enthusiasts and professionals. It features an innovative design that allows it to provide users with unequaled durability, safety, and performance. In terms of durability, the precision cutting chain is hard-chromed and heat-treated. These attributes give it unraveled resistance against wear. Oregon’s LubriTech Oiling system keeps the chain and the guiding bar lubricated at all times to improve their lives and lower the tool’s downtime. Hardened rivets deliver premium quality load-bearing surface capable of resisting wear and improving strength. The result is lower chain tension which means the tool will work for longer periods before requiring any adjustments. With 3/8-inch pitch and .050-inch gauge, the chain will handle large diameter woods even hard varieties fast and with ease. As such, the chain is great for both homeowners and professionals who need to tackle larger tasks. This accessory is compatible with most Echo, Oregon, Craftsman, Homelite, Poulan, as well as McCulloch 20" saws. STIHL Rapid Super chainsaw is what you need if your 20” chainsaw has to work perfectly. It is considered one of the fastest cutting chainsaw chains in the market. Besides, it is a reduced vibration model that features a cutter and a tie strap design. Such design considerably reduces vibration levels while still making use of the full chisel cutter technique. Chain friction too is minimal. This results from the chain’s razor-edged, squared-cornered cutter design. The minimal friction offers an incredibly smooth and clean cut in frozen as well as hard wood. These features ensure that STIHL 26RS Rapid Super offers exceptional efficiency when it comes to cutting and even plunge-cutting. Although the chain cuts superfast, it needs more careful maintenance and sharpening if it must perform optimally. These features make the 26RS suitable for higher power 20-inch chainsaws normally used in forestry and industry including limbing, felling and bucking. In other words, the chain is ideal for professional cutters with stupendous needs. In terms of specifications, the chain’s pitch measurement is .325 inches and a .63 gauge. It is crucial that you check compatibility of the chain with your saw before you buy it. Generally, the chain is compatible with 20” Farm Boss series and various models from STIHL. I’m highly optimistic that you have found the chainsaw chain among the models and brands in my review. The features I have preferred to highlight should give you an idea of what the best chain entails when it comes to the performance of chainsaws. The various features of the chains make very little differences in the performance of the chain. More importantly, they determine the fit or compatibility of the chain with a chainsaw. The overall performance of a chainsaw is, therefore, the power and quality of the tool itself. Conversely, a few chain factors influence how effective the chain will be in cutting. These are the factors you need to consider before buying the best chain for your chainsaw. The size of the chain you intend to buy must match the size of the guide bar on your chainsaw. The size is given in terms of inches and is always labeled on the tool’s body. For instance, if your chainsaw has a bar measuring 18 inches, you must find a chain measuring 18 inches. A mismatch would result in a non-fitting accessory or the saw will be too loose to cut. You can find the information about the chain size displayed on the package of the new chain. In case you doubt, you can manually measure it with a measuring tape. Both the gauge and pitch of the chain determine the level of vibration as well as the tension of the chains as it sits on the guide bar. The exact measurements of the pitch are gauge are always on the package of the chain. However, I strongly advise you against relying on the recommendations labeled on the package about the saw brands they can fit. The information may be wrong. So, it is important that you confirm with the manufacturer via a phone call, email or any other appropriate communication method. Kickback is extremely dangerous. Unfortunately, it is a problem that many chainsaw brands have and it has all to do with the chain. Kickback is very common with saws that can cut hardwood very fast. It occurs when the cutting parts of the chain get stuck in the wood while the machine is in full throttle. The force of the reaction pushes back on the operator. This can lead to serious injury. Buy a chainsaw chain that is armed by anti-kickback ability. However, this important safety feature may negatively affect the traction of the chain. I believe your safety is more important. Vibrations are not good for the performance of any chain. It affects the traction and effectiveness of the chain during the process of cutting. This leads to energy wastage. The good news is that high-quality chains are fitted with features that minimize vibrations. Chains without the low-vibration feature will cut slowly and less efficiently. Another common cause of vibration is installing a chain with the wrong gauge. Ensure the gauge of the chain you are investing in is a perfect match to that of your chainsaw. A well cared for chainsaw does not require frequent chain replacements. However, sharpening of the chain’s teeth is necessary after every 2 uses. Generally, I would recommend that you replace the chain once you see any signs of reduced efficiency. Ensure the replacement chain you want to install perfectly fits your chainsaw. Do this by using a measuring tape to measure from the base of the guide bar to the nose. This determines the size or length of the saw and therefore the size of the chain. Alternatively, you can manually count the number of drive links that spread over the chain. The drive links are present on the inner aspect of the chain. They slot into the bar. Once you confirm the compatibility, you can embark on the process of changing the chainsaw chain. Broke Cutting Teeth: This happens when the chain hits a hard thing such as a metal or a rock during operation. With any teeth missing, the chain will not be able to cut smoothly and efficiently. Loose or Sagging Chain: Initially, you will be able to tighten the chain when it becomes loose. After a certain point, further tightening will not be possible. The chain won’t be taught against the guide bar. The danger of chain breaking is real in this case and that warrants replacement. Cutters Greatly Reduced In Size: In certain circumstances, the cutters tend to wear faster than the chain. If this happens, it is a true indication that the chain needs replacing. Without replacement, you will experience insufficient or excessive pull which interferes with the cutting efficiency of the chain. The process is not so cumbersome and takes a short time. Due to the nature of chainsaw parts, it is always important to safeguard yourself from any dangers even when the tool is not in use. Before you do anything, ensure you disconnect the spark plug. This will stop any chance of the tool starting up. Begin by removing the guide bar side panel. Most brands have two nuts or screws holding the side plate. Use your Scwrench, wrench or screwdriver to unscrew the nuts. Remove the plate to access the old chain. Sometimes, the brake of a chainsaw is attached to the saw’s guide bar side plate. In case your chainsaw has this attachment, ensure you unlock the brake before proceeding. Removing the side plate with the brake locked can make reinstalling the plate difficult if not impossible. Now that you have removed the side plates, you can release the chain tension. This will allow the chain to come off. Pull the nose of the guide bar away from the chainsaw. This will release the chain from the tensioner. Do this by pulling the drive links away from the guide bar and then slip the other end of the chain around the saw’s clutch drum. This will remove the chain with ease from the guide bar with everything attached to it. After removing the chain, locate the whereabouts of the tensioning screw on the inner aspect of the sidebar. Loosen it just a little bit. This process will greatly ease the process of installing a new chainsaw chain. With great care, thread your sharpened or newly acquired chain around the clutch drum of your chainsaw. Ensure that the drive links engage in the chainsaw’s sprocket. Continue by threading the remaining portions of the drive links into the guide bar and over its nose. Following proper threading of the chain along the guide bar and drum clutch, apply some tension into the chains by pulling on the guide bar’s nose away from the saw. A point to note is that you make sure that you seat the guide bar onto the adjustment pin of the saw. The side panel easily installs back if the guide bar is correctly placed beneath. Replace the plate and nuts or screws that hold it in place. Only tighten the nuts slightly at this moment. This is because the guide bar will need some little movement while you will be tightening to the right tension. Reach for the tensioning screw to the side of your chainsaw’s sidebar to adjust the tension on the new chain. To finish the replacement, tighten the nuts holding the side plates in place. Did you enjoy my chainsaw chains reviews and buying guide? I hope you did. As a DIY enthusiast, I find this review incredibly beneficial. If only I had it before I set out to buy a replacement chain for my Husqvarna chainsaw. The review captures all the important things concerning finding the best chain for your chainsaw. Using the information here can make the process of buying a replacement chain an easy exercise for you. Not only will you buy the best chain but also be able to replace it successfully within minutes. Please, feel free to comment and share this information with others if you find it helpful.